Sonny’s Real Pit Bar-B-Q | Eat It, Damn It! This is the first post of my Florida vacation. One of the nice parts of traveling is trying out the local cuisine. The first spot MG and I hit was Sonny’s Real Pit Bar-B-Q. We were starving once we got off the plane. It was a little after lunch hour and we did hadn’t had much to eat. Did they feed us on the plane? Well, we got a soda and a few bags of Pop Corners. Not really a meal, but I’m not complaining. I don’t think anyone has ever raved about an airplane meal, at least no one I’ve ever encountered. If it can keep costs down and they can get me there quickly, the hell with the meal. Sonny’s is a chain restaurant, and it does look like it is cut from the same cloth as TGI’s, Chili’s, or Applebees. That is not exactly a good thing, but I’m there for the food. Let’s see what they have to offer. 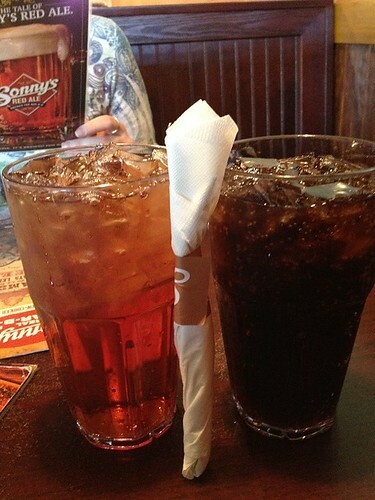 It’s a little hard to tell from the picture, but these sodas ($2.29, each) are HUGE. I put the flatware in between to give some sense of scale. My fist could almost fit into the mouth of these glasses. MG was ordering the brisket. Whenever there is a barbeque menu, MG is ordering brisket. Sonny’s had a couple options for brisket, pulled or cut. MG got cut. 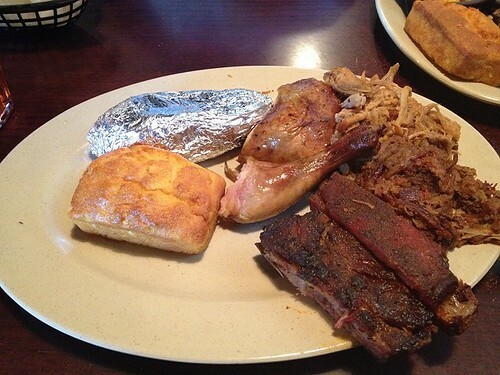 The lunch order ($7.99) comes with choice of two sides and choice of garlic bread or cornbread. The brisket is very meaty, not thick cut, but not paper thin. It is very tender and has a great smoky flavor. MG got the corn on the cob and macaroni and cheese as her sides. I thought the macaroni was very good, properly cooked, and cheesy without being too heavy. MG thought it needed a little more seasoning. 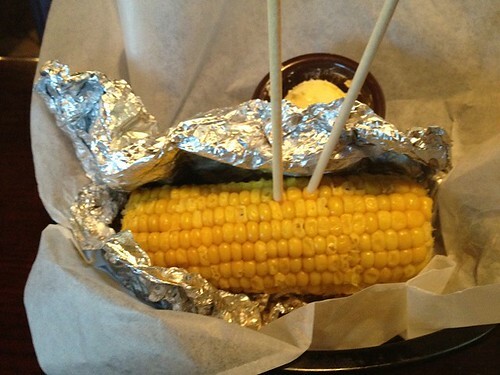 I did not try the corn on the cob, but she thought it was a little overdone. I got the Super Combo ($13.99). It comes with Pulled Pork, Barbeque Chicken, Pulled or Sliced Brisket (I got pulled), and Sweet or Dry-Rubbed Ribs (I got Dry-Rubbed). Everything was well cooked without being overdone. While everything was nice, nothing jumped out at me. The pulled pork is very tender, but there is no kick of vinegar. The pulled brisket was tender, but pulling took away some of the buttery texture of the sliced brisket. 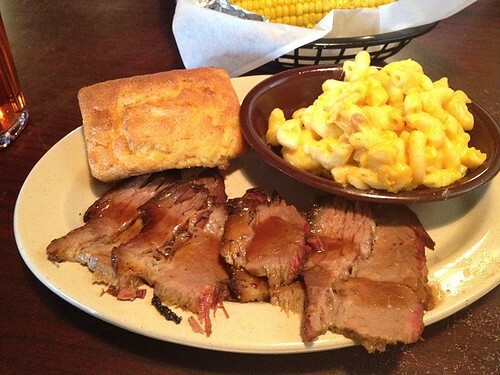 It was nice, but the sliced brisket was definitely better. The Dry-Rubbed Pork Ribs are heavily seasoned. I could feel the bark of seasoning on the outside of the ribs. To me, it tasted like really thick bacon. MG was not enamored with it, but not offended either. The chicken was tasty, but truthfully, I’m not a big barbeque chicken fan, so I can’t really say much about it. It wasn’t dry, nor was it exceptionally tender. The cornbread was very good. It was a proper mixture of corn and bread, not too dry nor falling apart. 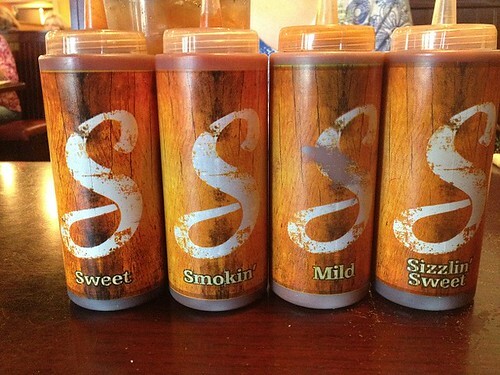 Each table has a set of four barbeque sauces. Sweet was… sweet (duh!). The Sizzlin’ Sweet was nice. I’m not sure how to describe it. It wasn’t overly sweet, nor overly sizzling. The Smokin’ was my personal favorite. The flavor was rich and pleasant. A kick hits the tongue a few moments after ingestion. It was like a spit of Tabasco was added to a decent barbeque sauce. One of my sides was the baked sweet potato. It was fine, properly cooked, and tasty, but nothing special. The other side was the baked beans. They were very good. I really liked their flavor. There were a few bits of brisket inside the beans. 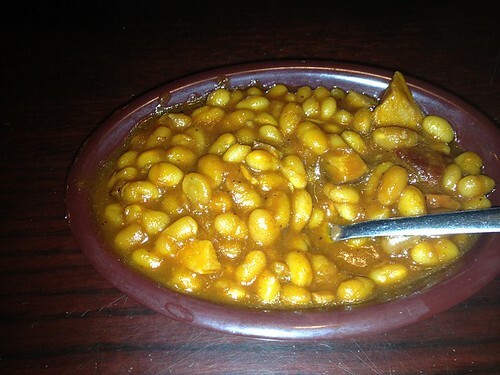 Their sauce was sweet and complimented the beans well. Sonny’s was not a transcendent experience. However, it was a good quick bite. 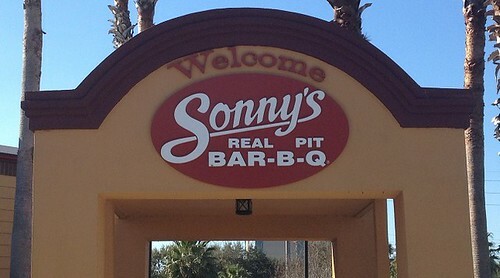 It is very close to the Orlando International Airport, so if you are absolutely starving once you get off the plane and need something immediately, Sonny’s is definitely a good place to stop. They have a large specialty drink menu and a large bar area if you need someplace to kill some time before a flight.